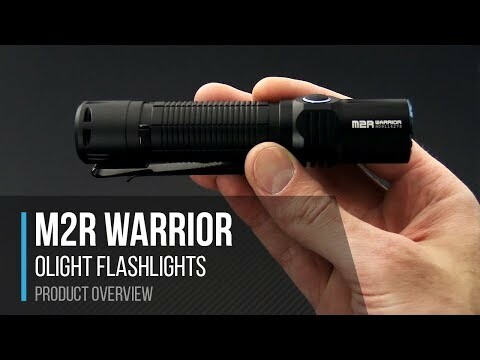 The Olight M2R Warrior is part of their M Series Tactical/Military line. This slim head rechargeable flashlight can be easily carried on your belt or in your pocket. Simple USB powered recharging system connects to the light magnetically no need to worry about polarity or having to remove an access cover. The included high capacity Li-Ion battery provides extremely long runtimes between charges, as well as, a substantial long term cost savings over standard consumable battery types. The light features a side switch for easy operation and a tail cap button that provides quick access to either Turbo or Strobe modes. This is a powerful yet easy to carry model that is just at home in non-military scenarios. This is a Limited Edition version with a solid, raw copper body. Body: A solid copper body construction with knurled center section has a non-slip grip and the magnetic tail cap can attach to most ferrous objects for hands free use. O-rung seals provide protection against water submersion and a IPX8 rating. The smooth reflector offers a standard hotspot diameter with impressive distance for a balanced central and flood beam. Also featured is an attached stainless steel removable pocket clip that can be reversed for lens up or down carry. Includes a quick release Nylon belt holster, lanyard, magnetic charging cable and 10A HDC 3500mAh 18650 battery. Operation: Easy to use with a side power/mode switch. Just tap the switch to resume to the last mode used. While the unit is on, press and hold to cycle through the brightness levels. A quick double tap will turn the light on to the highest level regardless of what mode was last used. Three quick taps puts the light into a disorientating strobe mode. Holding the button for more than one second will enable moonlight mode. Quick access stainless steel tail switch can be programmed to either standard mode for Turbo or enhanced tactical mode for Strobe. This is user selectable by holding down the tail switch while then pressing the side switch. Charging: Recharge the battery while inside the light through the included USB charging cable that connects to the tail cap magnetically. This light is also compatible with the optional Micro-Dok triangle shaped USB powered base.